This small town, located at the feet of the Sierra de Queralt, is the capital of the Berguedà county, a bastion for royals in Cataluña in the 19th century. It is known for its popular cuisine and its ancient festival of Patum. The tour around the fortifications, the visits to the two interpretation centers, the churches, and the other places to see in Berga will most likely take the whole day to complete. After you have completed these activities, you can culminate your journey by climbing to the Queralt at sunset to enjoy the incredible views from the Sanctuary of Santa María. A good spot for hiking can be found around the ski slopes of Rasos de Peguera. On the road returning to Barcelona, it is always nice to stop for a few hours to see the fortifications of Balsareny. Berga has an interesting local cuisine and places to stay, which you can read all about in our pages for eating and staying in Berga. Want to Get to Know this Place? The origins of Berga are not completely clear, and although there are remains from the Epipaleolithic Era (8,000 years ago) within its city limits, some specialists identify the place as an old Iberian castro which was later Romanized. In 715, the area was taken over by the Muslims, who would remain there until the end of the century. The oldest document that has been discovered is from the 10th century, when it relied on Barcelona. In the 11th century, and counts of Berga Wifredo II and Bernardo Guillermo came to exercise their lordship independently. However, in 1117, the county was fully integrated into that of Barcelona. The castle became very important in the 12th century. From 1309, the village has been under royal dominion under the reign of Jaime II, but in 1381, it returned to its position as a feudal property, and it was controlled by count Mateu de Foix. In the middle of the 14th century, the Plague came to Berga. However, the village came to be very important in that time because it was surrounded by a belt of walls. In the 15th century, Berga declared its support of the Generalitat government during the Guerra Civil that ravaged Cataluña. In 1581, the city suffered attacks by the Huguenots, and until 1655, the town was in the hands of the French. In 1655, during the Guerra del Segadors, the French besieged the garrison loyal to Felipe IV, and one of its mines destroyed the church of the fortress. The affects of the War of Succession were also felt in the city, but in this case, the town lent its support to the Duke of Anjou. With the revolt of Cataluña against Felipe V, the population of Berga remained loyal to the king. The castle’s garrison, supporters of the archduke, were besieged for a week by local militia called La Coronela, who were loyal to the king. The Guerra de la Independencia also altered the lives of the people in Berga. The town isvery close to the border with France, and the town declared that they would not be subjected. The town then played a prominent role in the Carlist conflict, which turned the town into a bastion by building the Petita Tower in 1836 for defense. It was a key operative center for the cause. The general Esparto assaulted the city in 1840, just before the final defeat. In 1854, Cholera raged among the town’s population. In July of 1873, the Carlist general Savalls attacked the governmental garrison, conquering the town and establishing a governmental board. 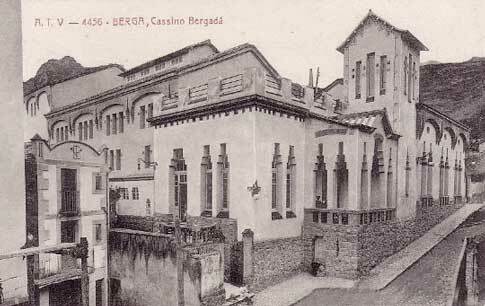 In gratitude for the loyalty of the liberals of the city, the government gave Berga the official title of “city” in 1877. During the Guerra Civil of the past century, the town lost much of its historical heritage. In 2005, the Patum, the main festival of the county, was recognized by UNESCO. This original cultural manifestation is related to the period before a theatrical representation in the festival of the Corpus. Our visit to Berga begins at the top of the hill with the Castle of Sant Ferrán, which used to hold an ancient Iberian village. The medieval fortification was totally transformed in the 16th and 18th centuries. The parochial temple, which was originally kept inside, was abandoned and converted into barracks. A good part of its walls, defensive towers, and bastions are still standing in addition to its weapons courtyard. The castle played an important part during the Carlist Wars and was besieged. In 1925, the Army sold the barracks to the city council, who gave it to an entrepreneur in 1965 to build a hotel in its vicinity, which was later demolished. The Portal de la Magdalena is the only medieval point of access in the city that has been preserved, and it is on the road that leads to the Ripoll Abbey. It was put right on the spot where there was a chapel with the same advocacy. In addition, the upper part of the door later adapted to accommodate a dwelling. The walls had been erected during the time of Pedro III (14th century), and there are also some parts interspersed from the end of the 18th century, corresponding to the bastion of San Carlos. During the French attack in 1655, the parochial temple was destroyed, so the Capilla de la Pietat (17th century) was used as a substitute while the new one was being built. This little church was in charge of the Mercedarios in the 13th century. It presented a simple aspect, and its main façade is crowned by a modest belfry. The interior displays a Baroque aesthetic. The sober Iglesia de Sant Joan of Berga conserves medieval elements, and its origins can be traced back to the 13th century. The heart of Berga lies in the Plaza de Sant Pere, where the parish with the same name stood until it was burned down by the Huguenots in 1655. Thus, this place is also known as Plaça Cremada. They built the new temple of Santa Eulàlia (1671) in the Baroque style. Inside, above the organ, you’ll find the murals and the Capilla dels Dolors. Another emblematic ecclesiastical foundation is the Convento de San Francesc (14th century), whose temple was redone in the 19th and 20th centuries, and it suffered damages in 1936. Its forefront was rebuilt following the historic Neogothic style, in which the belfry stands out. Berga also offers industrial buildings. In the Calle Ciutat, you’ll find the Casas de Tomàs Pujol (1925), with interesting ceramic decorations, and Barons (1904), with an equally Modernist aesthetic. A Casino was also built in 1913. In the building that housed the Poor Hospital of San Bernabé in the 14th century, there currently exists a large mural that celebrates the main festival of Berga, the Patum. Nearby, you’ll find the domed Calle Balmes, which is linked to the Jewish quarter of the city. The Centro de Interpretatión de la Historia de Berga is on the Calle dels Angels. 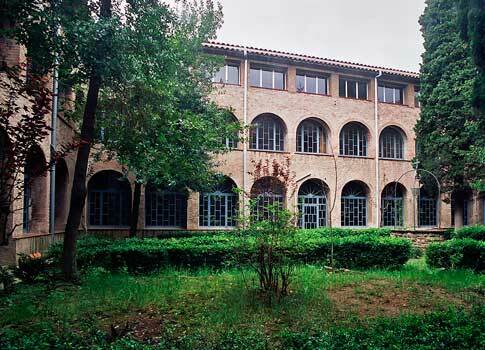 The natural sciences also have their own space in the Centro de Interpretación de la Naturaleza del Berguedà, located in the Plaza del Doctor Saló. There are also two monographic museums dedicated to the Circus and the Patum, the official local festive manifestation. You can still see several hydraulic flour mills in the city center like the Gratella, the Brillant, and the Molí de la Sal, which are probably from medieval times. The famous Iglesia de San Quirce, in Pedret, which is originally from the 10th century and later reformed, preserves two of its three medieval naves. Its original façade and its painted walls from the 13th century stand out. These show a reproduction after being removed in 1922 to be kept in the Museu Nacional d’Arte de Catalunya (Barcelona). If you feel like climbing to Queralt (1,200 meters high), you’ll find the 18th century Santuario de Santa María. From here, you can see the whole county. It is now possible to go up in a cable car. The sanctuary has three naves, and its Baroque altar was burned in 1936. After the war, the whole structure underwent intense restorations. The most valuable part of the sanctuary, a medieval image of the Virgin, is on the inside. Those who want to ski can head to the nearby Estación de Rasos de Peguera for the winter sport. It is convenient to leave your vehicle in one of the access roads near the urban center.